The Merchants House: 31-37 North Moore Street – ARPAD BAKSA ARCHITECT, P.C. These two buildings were in severe disrepair due to fire and years of abandonment and neglect. 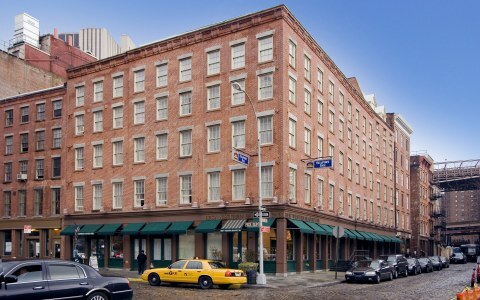 Upon completion of our work, these buildings were registered on the National Register of Historic Places along with the surrounding Tribeca district. The highest level of historic preservation was achieved through a complete facade restoration including window replacement and terra cotta restoration, cast iron storefront restoration, loading dock and canopy reconstruction. As part of the adaptive re-use, an inner court was created and two new floors were added on the roof. The owners of The Merchants House, Dah Chong Hong, Ltd., wanted to restore the building and convert it from light-manufacturing to retail and residential luxury condominiums since it did not make economic sense to restore the building to light manufacturing use. In addition to the restoration and conversion of the existing building, the clients also wanted to add two additional floors to the building at 35 N. Moore and an additional floor at 31 N. Moore to maximize the floor area. The first step in obtaining approval for the project required that an application was filed with the Landmarks Preservation Commission (LPC). There was extensive work outlined in this application including the restoration of the North Moore Street façade, a gut rehab of the entire interior of the building, and proposed new 7th and 8th floor additions which would only be visible from St. James Park. The façade restoration had many aspects to it in terms of the application. Those parts of the façades which were destroyed by the fire would be rebuilt using matching materials to replicate the façades from historic photographs. 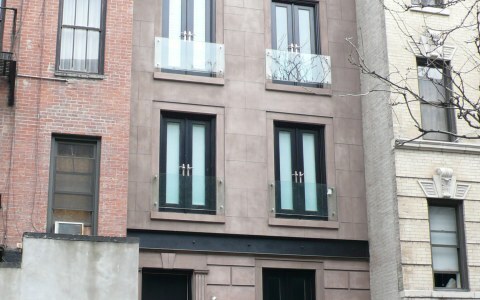 This included finding an acceptable matching brick to rebuild the facade, the replacement of all windows with the installation of new wood windows and frames which duplicated the historic windows, the repair and replacement of stone lintels and sills, and the duplication of the terra cotta capitals and banding on all facades. Another of the distinct features of the 35 N. Moore facade was a stone band between the 3rd and 4th floors which displayed the building’s address numbers 35 and 37, and “MERCHANTS REFRIGERATING AND MANUFACT’G CO”, the original tenants of the building and the projects namesake. Those parts of the façade which were not damaged by the fire were cleaned and preserved. The cast iron storefront was restored. The loading dock was replaced with a new diamond plate loading dock and a new canopy was installed above. Salvaged materials from the previous loading dock were reused in the fabrication of the new loading docks. The second major aspect of the work in the LPC application was the interior work. The buildings were used for light manufacturing purposes originally but then became abandoned and vacant for 2 years after the fire. The first portion of the interior work was to entirely gut both buildings. An inner court was created in 35 N. Moore during the removal phase to provide legal light and air for future residential use. This was necessary because the building occupied the entire through-lot and, as a manufacturing building, did not have any light or air requirements which needed to be fulfilled. The floor area would be reallocated to the proposed new 7th and 8th floors. While the court was being created during the removal phase, new floors were installed at the 4th, 5th and 6th floors. The second portion of the work was the creation and installation of the core building systems which both buildings shared. The Merchants House was the first time that two separate buildings were allowed by the Department of Buildings to share such systems. They shared the sprinkler, heating, plumbing and electric systems. During this portion of the work, the first floors of the buildings were converted to retail use. 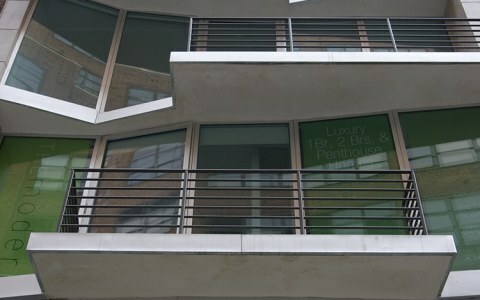 The last portion of the interior work was the creation of the residential luxury condominiums. The condominium units range from 3-4 bedrooms, 2-4 baths, and 1-2 living rooms. The standard amenities in each unit include fireplaces, marble stone in the baths and powder rooms, high end bathroom fixtures, and large open kitchens with custom woodwork, high end appliances and granite countertops. The master baths contain 4-5 fixtures and include a shower. Many of the units are duplexed and some include living rooms and fireplaces on both floors. A parking garage containing 12 spaces was built in the cellar of 35 N. Moore for the use of the residential tenants of the building. The entrance to the garage, at Ericcson Place, consisted of an entire bay in the restored cast-iron storefront which raises open. Storage unites are also provided in the cellar for the tenants. The air conditioning system of each unit is located outside of the unit in the hallway to lessen the noise infiltration into the unit by the system. The final aspect of the work in the LPC application was the creation of a two-story addition at 35 N. Moore, which was not visible from any street thoroughfares, and a one-story addition at 31 N. Moore by using reallocated floor space. The 35 N. Moore addition was set back 33’-0” from each street façade to decrease its visibility. The 7th and 8th floors would contain only two residential condominiums, one facing North Moore Street and the other facing Ericcson Place. The 31 N. Moore addition was not visible from any street thoroughfare. It was duplexed with the 6th floor of 31 N. Moore. After the project received a Certificate of Appropriateness from LPC, the conversion to Residential Condominiums required obtaining a Special Permit (filed as per ZR 74-711 in conjunction with LPC) from the City Planning Commission since residential use was not permitted “as-of-right”. The parking in the cellar required a Chairman’s Certificate from the City Planning Commission. 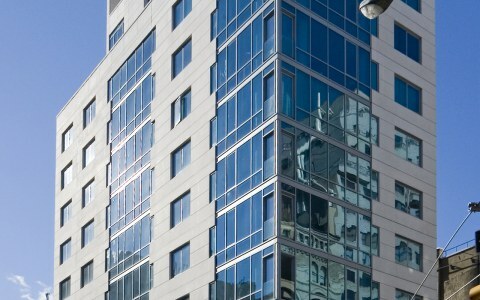 Finally, after all the aforementioned approvals were obtained, the project was approved at the Department of Buildings. When the project was completed, it was registered into the National Historic Register as an individual landmark for adaptive re-use. In addition, we aided Higgins & Quasebarth in placing the entire district on the National Historic Register.